The cast of characters in this little movie are the researchers Frank (Digger) Dawson, Tim Brookes, Joan Witt, and the two person crew of the East Liverpool Historical Society Web Site. The central person and star is Elaine Riley and her willingness to talk to us during two phone interviews, her memory and her sense of humor and friendliness. This script was written primarily by Matt Stewart. 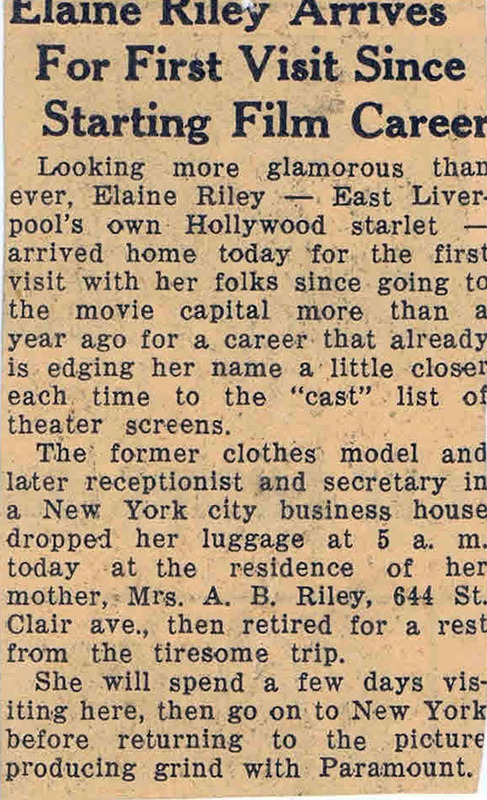 Several months ago on a Facebook site: Memories of East Liverpool, Ohio, it was mentioned that information had been found online about an East Liverpool native, Elaine Riley, who had achieved success as an actress in Hollywood. A member of the staff of the East Liverpool Historical Society web site was present when the comment was made and became curious. After some online "snooping" a brief (and not so informative) article was put together, and on May 20, 2011 it appeared on the society's web site. The former Standard Pottery Co. Building Circa 1943. 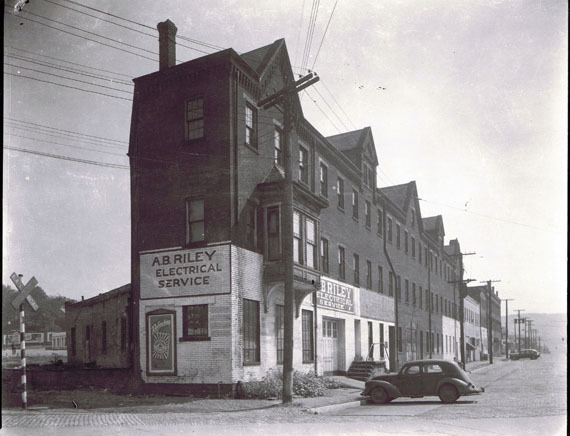 At that point, historical society president Tim Brookes wondered if there might be a connection between Elaine Riley and the owner of the Riley Electric Company that had existed on Broadway (as shown in the above picture). Around the same time, Frank Dawson had invited a member of the historical society to look through his collection of photographs to see if any could be used for the web site. 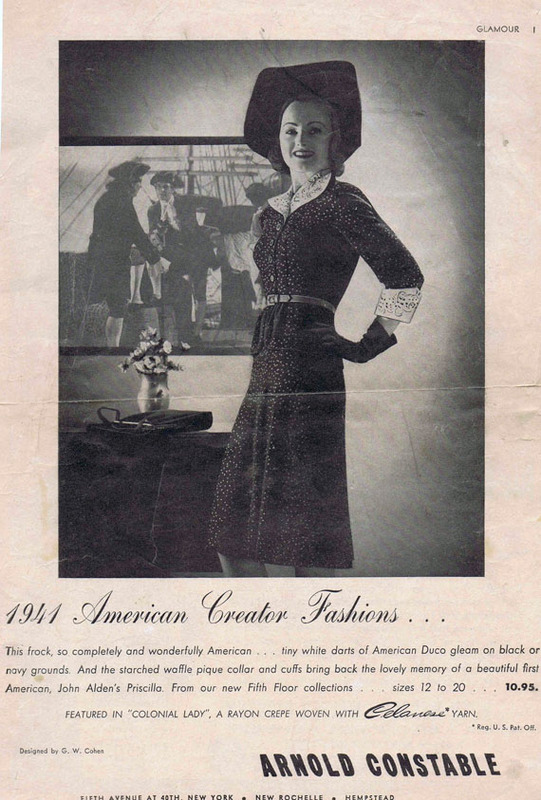 Among them was a series of pictures from an advertising photo shoot done for the former Golden Star Dairy, three of which featured an attractive young woman. In two of the pictures she was standing beside or getting into a car, and in the third she was posing in the dairy holding a glass bottle of milk. 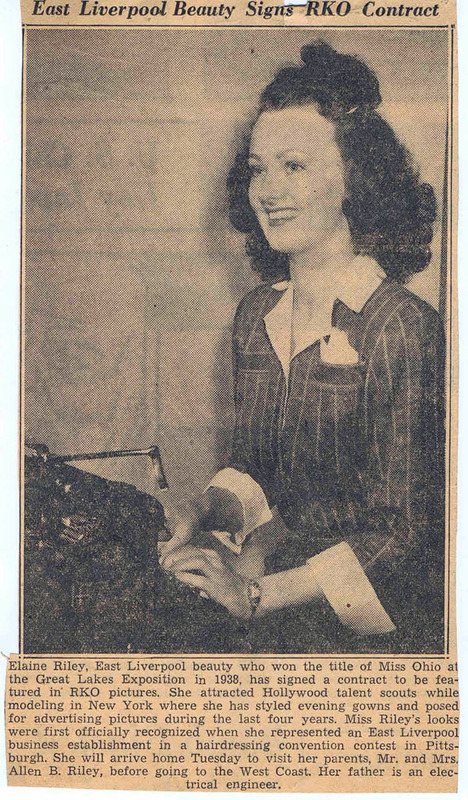 [It was thought that perhaps that was Elaine Riley but later when sent copies of the pictures she said it wasn't her]. Regarding the 8x10 black and white photo of the Riley Electric Company, the business [officially listed in the city directory as "The A. B. Riley Armature Rewinding, Electrical Service for Industrial Plants"] was located along the "Horn Switch" on lower St. Clair Ave. The picture was taken from the bottom of St. Clair Avenue looking south, showing the long line of buildings that once made up the Standard Pottery. Riley Electric was on the north corner at 638 Broadway (the East Liverpool Fire Department is at 635 Broadway), aligned with a cluster of storefront-type structures which meandered toward East Sixth Street. Some research revealed that the Riley Electric Company was owned by Allen B. Riley, a native of Chester, W.Va. According to the city directory, he and his wife, Pearl, lived at three different East Liverpool locations over the years: College Street, Dresden Avenue, and 644 St. Clair Avenue. They had two daughters, Lillian, who married William Paisley of Wellsville, and Elaine, the subject of this essay. Elaine Riley was born in East Liverpool and was a member of the East Liverpool High School class of 1934. While in high school, she studied music and appeared in theatrical productions. She once held part-time employment at the G.C. Murphy Co.-known by locals as the "Big 5&10"-often going next door to Peoples Drug Store for lunch or an ice cream sundae. The "Big 5 & 10" is the white building next to Peoples Drug Store. Frank Dawson's Collection of pictures. 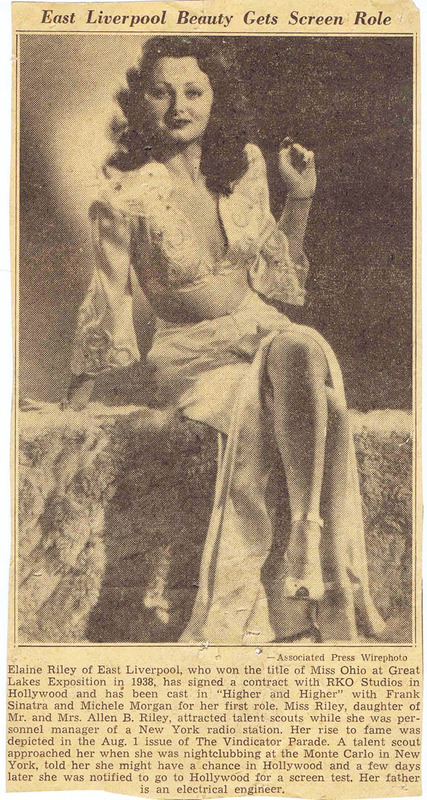 After being chosen "Miss Chic" at the Cleveland Exposition, Elaine traveled to New York at age 18, where she became a Powers and Hattie Carnegie model. Living and working in New York for six years, she eventually was encouraged by friends in the theatrical world, including Frank Sinatra, to move to Hollywood where she would become a successful film actress. 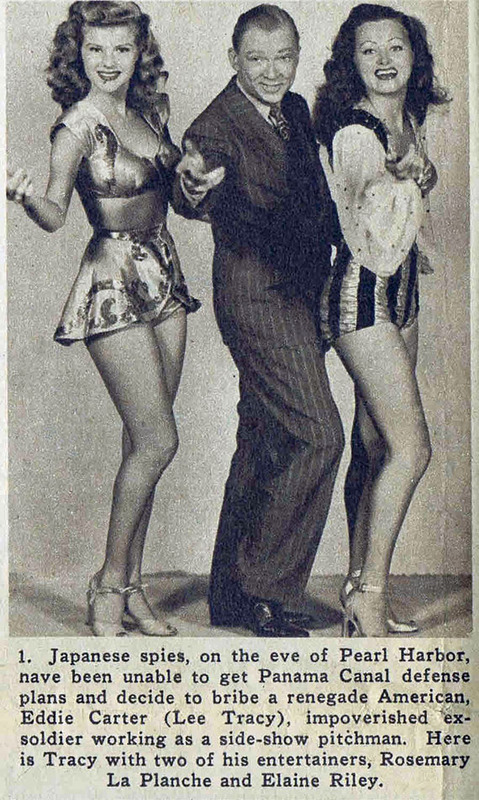 Elaine's sister, Lillian, who also made the move to California, gained employment in the legal department of RKO Studios. 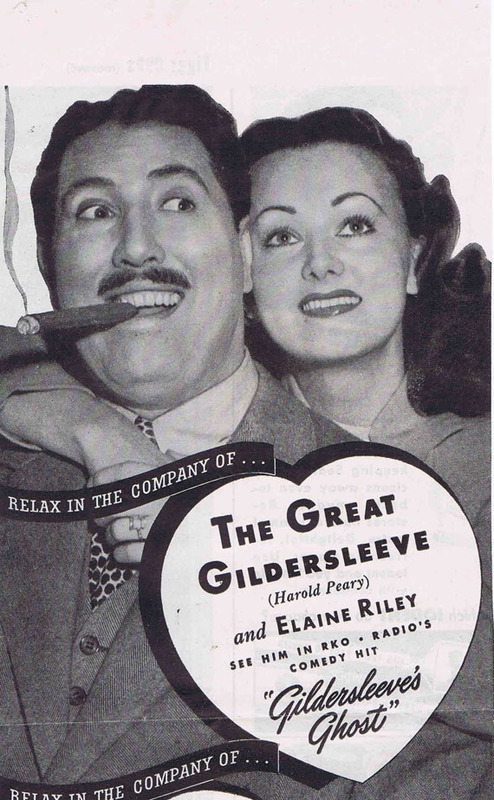 Elaine Riley was signed by RKO in 1942, where her first assignments included the studio's Leon Errol two-reel comedies. She went on to play minor roles in RKO's feature film products, showing up as hat check girls, waitresses, and chorus dancers. Larger parts came her way in the studio's Tim Holt Westerns, in which she was usually cast as a damsel in distress. After leaving RKO, she freelanced at Paramount, Monogram, and other studios until 1960. Throughout her career, she appeared in some 70 films and TV shows. See a complete list of Elaine Riley's work at the Internet Movie Database. On Thursday, June 9, 2011 we placed a phone call to the number listed for Elaine Riley, who answered the telephone with a spry voice. Elaine was pleased to answer questions about her career. She quickly recalled her hometown and many of her friends including; Harvey Moninger, Chan Keys, "Red" Waggle, Joe Wells, Jr. and his sister Virginia (Kelly) along with Mary Scott (Musuraca). She asked about the Ceramic Theater, Thompson Park and the Methodist Protestant Church (where she was baptized) along with the Rubin and Hoffrichter families. The name of Latin teacher Bertha Arts also came up along with Band Director Ralph Johnson. Elaine also spoke of her father's electrical business where he did troubleshooting for many of the large industrial companies in the region, including Weirton Steel and McClain Firebrick. She stated that he would often flag down a train, riding at no charge to various locations where armatures and generators had malfunctioned, needing his engineering skills. When questioned about her sister, Lillian, according to Elaine, she had two daughters Barbara and Megan, a graduate of Stanford University and currently residing in Italy. In 1948 while working in the legal department of RKO Studios, industrialist Howard Hughes took over the company, and after years of decline under his control, the studio was acquired by the General Tire and Rubber Company in 1955. The original RKO Pictures ceased production in 1957 and was effectively dissolved two years later. Lillian was, as the expression goes, "the last person out to turn off the lights and close the door." In 1981, broadcaster RKO General, the corporate heir, revived it as a production subsidiary, RKO Pictures, Inc. In 1989, this business with its few remaining assets, the trademarks, and rights to many classic RKO films were sold to new owners, who now operate the small independent company RKO Pictures LLC. In 2004, Elaine Riley was presented with the Golden Boot Award, which honors actors, actresses, and crew members who have made significant contributions to the genre of Western television and movies. The award is sponsored and presented by the Motion Picture & Television Fund. Money raised at the award banquet is used to help finance various services offered by the fund to those in the entertainment industry. Actor Pat Buttram conceived the idea of the Golden Boot Award, and the first ones were presented in 1983. Other recipients include: John Wayne, Clint Eastwood, Jack Palance, Jane Russell, Ronald Reagan, Bob Hope, Gene Autry, Roy Rogers, Lash LaRue, Tex Ritter, Andy Devine, Chuck Carradine, Ernest Borgnine and Dale Evans. Elaine Riley was born in East Liverpool, Ohio on Jan. 15, 1917. During most of her growing up years the family resided on College Street. The house she grew up in on College Street no longer exists. In a phone interview Elaine talked of her and her family attending the Ceramic Theater a number of times while growing up. It was only a short walk away from their home. When asked what elementary school she attended, an interesting fact was revealed. Elaine said she attended first through eighth grade at the Central School across from the Carnegie Library on Fourth Street, which is now the site of the East Liverpool Alumni Association headquarters. She noted that they did change classes between Central School and the newer high school on E. 4th and Broadway [now a Kent State building] when she was in eighth grade. She felt it was probably part of the process of transitioning the students to being in high school. Elaine began school when she was five years old, which would have been around 1922, and she was graduated with the class of 1934 at 17 years old. She didn't recall many of her fellow students, but she did remember several of her teachers. She was very surprised to hear that Central School had been razed. When asked of her impressions of living in East Liverpool, she told a story. She vividly remembered standing on the steps of the post office at the corner of Broadway and East 5th Street [now the Museum of Ceramics] when she was nine years old and thinking to herself that she didn't belong here. 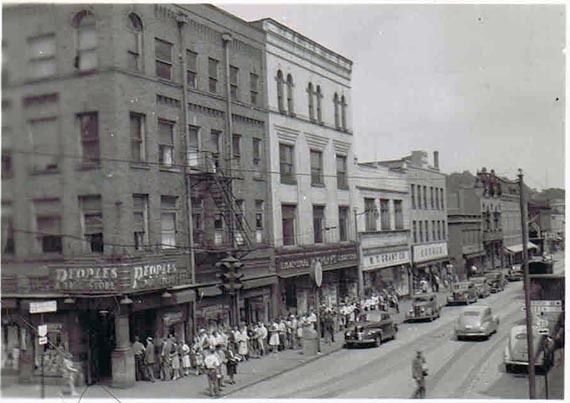 However, she did go on to say East Liverpool was a wonderful, thriving place, and she was glad to have grown up there. During the conversation Elaine stated that when she was beginning her career, she looked young and she still does. Because she looked so young back then she gave her date of birth as Jan. 15, 1923. In her mid 90s how, Elaine says she remains in good health and takes no medications. She says she exercises about an hout and half 5 days a week. She also mentioned that at one point in time she had been involved in offshore sailboat racing. In the same phone conversation she did say that her time in New York and Hollywood was very precious to her. In the second of the two phone conversations, Elaine related a very upbeat and fun story. She stated that she knew the "man in the moon." One evening she was introduced to NASA astronaut Buzz Aldrin. She shook hands with him with a full moon overhead. It was mentioned that if someone wrote that into a movie script, no one would include it in the movie since it would be so unbelievable. She laughed and said yes that was true. Elaine during her modeling days in New York. Pages 18-20 of Life Magazine September 13, 1943 issue one finds an article about Hollywood trying to find the shapeliest "Shadow Girl". In RKO's psychological horror movie The Ghost Ship the leading lady is never seen. Only her shadow in silhouette is seen. To find the shapeliest "shadow girls" the studio dressed several of its stars in skin tight swim suits and had them parade behind a screen. Elaine looks quite delightful, don't you agree? Promo from the Youngstown Vindicator Sunday, March 18, 1945 for the movie "Betrayal From The East". 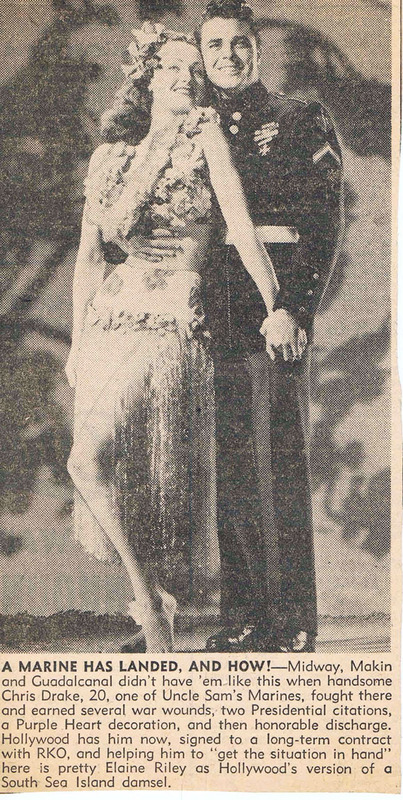 Chris Drake, pictured here with Elaine was a film actor and television actor from 1944 to 1961. He died in July 2006.